Featuring the extraordinary voice of Mavis Staples, the family band delivered Seventies’ R&B/Soul classics such as Respect Yourself, I’ll Take You There and Let’s Do It Again, all of which are included here. Among the 80 songs on four CDs, you’ll find all of the group’s best-loved hits, studio and live recordings, plus a sprinkling of demos and previously unreleased material. The fifth disc in the set is a seven-inch vinyl single with the group’s two earliest known recordings, A-side Faith and Grace and B-side These Are They. This is the first time these two tracks have been available in any format since the Staples’ self-released edition of 500. 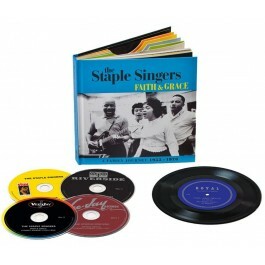 The CDs and vinyl record are packaged in an old-school ‘45-folio’ package, and the accompanying book promises rarely seen photos of the family taken over the course of their career plus new liner notes by Mavis Staples, Opal Louis Nations, James Miller and compilation producer Joe McEwen.